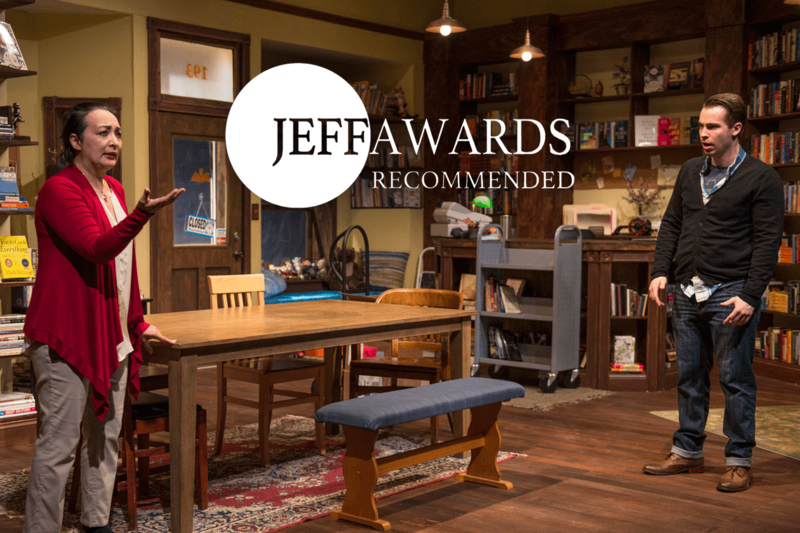 Following an awesome opening night performance, About Face’s Chicago premiere of after all the terrible things I do is a Jeff recommended show! Not a bad way to start off a run, right? Do. Not. Miss. Out. Go early in the run as there is no possibility of extension. Don’t say I didn’t warn you! Here are some pretty production photos to whet your whistle. Meanwhile, I’m already in tech for Ma-Yi Theatre Company’s world premiere of House Rules, which begins previews in New York next Friday, March 25. As I’ve mentioned before, this cast and creative team are so stupidly talented. I really can’t wait until you see what we’ve come up with, so click here for show info. You can also visit Ma-Yi’s blog where the theatre has been posting Q & As and bios with the creative team and cast. And look at that poster — I love that poster! It’s an actual sculpture assembled and photographed by Noah Scalin. Tickets for terrible things are here for you Chicago folks, and tickets for House Rules are here for my New Yorkers. Finally, for more info about both shows and about me, American Theatre published a profile of me yesterday to coincide with my two show spring. Having my work honored this way is wonderful, but the fact that the article also honors the awesome artists, theatres, and institutions that supported me blows my mind. Thank you to Suzy Evans and everyone else at American Theatre, as well as May, Ralph, Andrew, and all the rest! 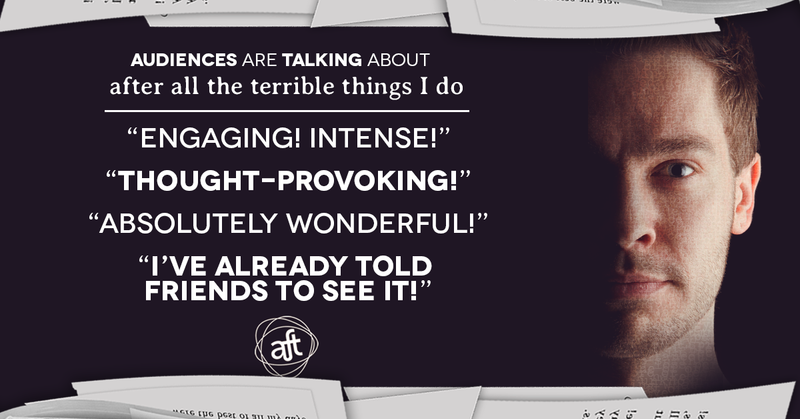 Opening night for About Face Theatre’s Chicago Premiere of after all the terrible things I do is right around the corner! We’ve been tinkering with the show a bit in previews, and I’m excited for you to see the results. This cast and creative team made me fall in love with Chicago all over again (which, come on, wasn’t hard to do), and as you can see from preview audience responses posted in these images, Chicago has been in love with us! 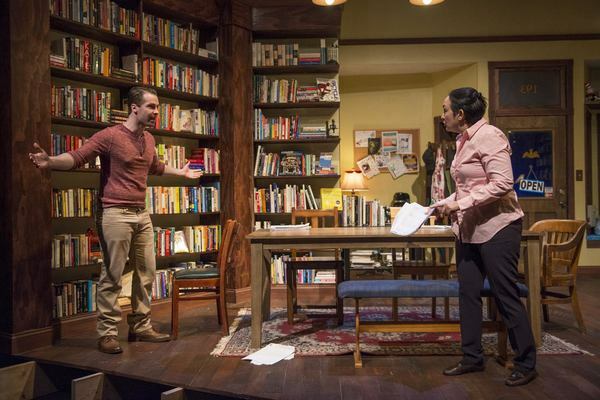 And, in case you missed it, the show has been on multiple must-see lists for Chicago in March, like Time Out, Chicago Magazine, and the Windy City Times itself. The show runs until April 10th, so get your tickets now! 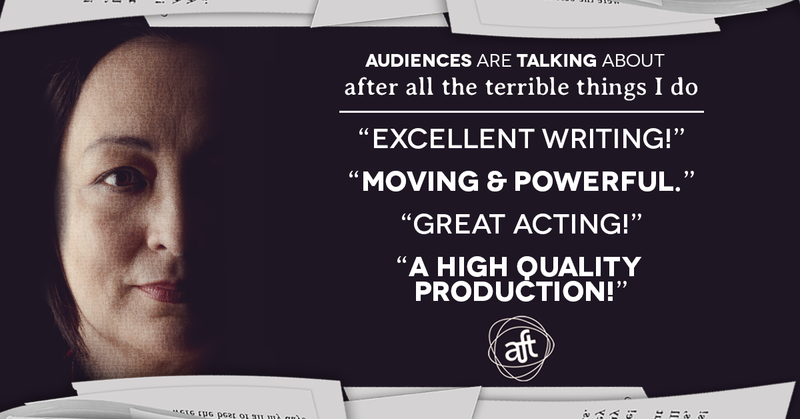 A gripping and intimate new play from one of American theatre’s rising stars explores the dark side of ordinary people, second chances, and the price of forgiveness. Returning to his Midwestern hometown after college, Daniel, a young, gay writer, takes a job at the local bookstore he knew as a child. After he and Linda, the Filipina bookstore owner, begin working together, they discover they share a dark connection that goes much deeper than a love of literature. I was fortunate enough to spend time in rehearsal with About Face‘s production of after all the terrible things I do this weekend. They’re almost midway through their process and doing excellent work! Hanging out with Artistic Director and director of the play Andrew Volkoff was great, and Colin Sphar and Lisa Tejero are having a lot of hilarious (and sometimes scary) fun with Daniel and Linda. There’s information about the production on Broadway World and on About Face’s website and tickets are already on sale here. The theatre is just coming off of a big hit with a production of Philip Dawkins’s beautiful play Le Switch, which has meant tickets for our show have already been selling. Don’t get shut out! I’m serious. BUY NOW. I’m excited to rejoin everyone for previews March 11 – 13, and I hope that I either see you there or that you catch the show later in the run! That’s right! It looks like Spring 2016 has decided to mimic Spring 2015 only in two separate cities. First, the world premiere news! In March 2016, my newest play House Rules will be produced by The Ma-Yi Theatre Company at HERE Arts Center, directed by Ma-Yi Artistic Director Ralph B. Peña. To say that I am bouncing off the walls that this play is being mounted by my primary artistic incubator would be an understatement. I’m in pain, y’all, IN PAIN from all this bouncing off walls, floor, ceiling, down stairs… OW!!! And for this season my show will come just after Washer/Dryer by Nandita Shenoy (a fellow member of the Ma-Yi Writers Lab of which I’m currently co-director) and a remount of Lloyd Suh’s The Wong Kids in the Secret of the Space Chupacabra GO! (who was co-director of the Lab for much of my membership and Artistic Director of 2g when they mounted the world premiere of Thunder Above, Deeps Below). This spring will truly be a family affair, pushing the boundaries of new Asian-American playwriting and (particularly with this season) comedy. WE GOT JOKES. 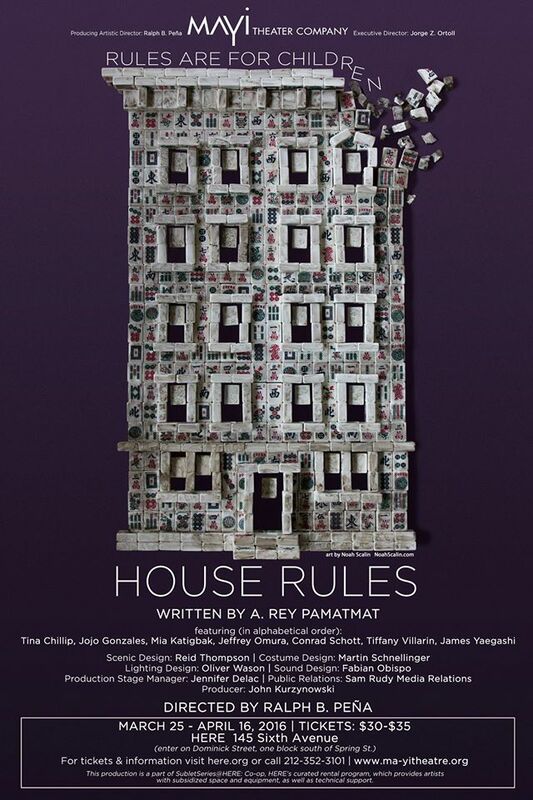 House Rules by A. Rey Pamatmat. Rod thinks the game is fixed. Momo’s still learning the rules. Twee doesn’t think winning is enough. JJ hates his hand. And why the hell is Henry still playing? Two families (and some guy named Henry) panic with hilarious and heart-breaking results when they realize their parents won’t be around forever. Can anybody prepare for the inevitable moment when they’re the ones left holding all the cards? Also, you may have already heard since they announced in July (whoops, sorry), after all the terrible things I do will be seen next March in About Face Theatre’s 25th Anniversary Season, directed by AF Artistic Director Andrew Volkoff! I’m thrilled not just for the Chicago premiere (you know how much I love that city!!! ), but because the other shows in the season are by artists for whom I have the deepest admiration. A new play by Philip Dawkins and a Bonnie Metzgar-directed production of The Five Lesbian Brothers’ The Secretaries is the very definition of being in esteemed company. I am so honored and grateful to be in the same sandbox as these folks, and if I were a Chicago resident, this is a season to which I would subscribe in a heartbeat (HINT HINT).